Over the past year and a half, I’ve observed a large number of trauma survivors struggling with their identity. It’s not surprising, actually. So many survivors have been told who or what they are. Some survivors even sadly refer to themselves by surface-level labels (victim, orphan, nuisance) either by choice or because that’s how they’ve been referred to their whole lives. So, it’s safe to say that I’m not a huge fan of labels or generalizations. But sometimes, it’s hard to ignore when you come across one of those and it just feels right. Believe it or not, it also helps you form a connection with a community, even if you never meet a single person in that community. How does that work? Well, for one, by learning and accepting that you are not the only one with that label or generalization (whatever it may be), you’re immediately aware that there are others like you out there. In fact, sometimes these labels help “normalize” otherwise undesirable traits. For example, I always believed that being an introvert was a bad thing. I even remember a high school teacher once say, “Extroverts make the rules, introverts just follow them.” Looking back, I’m not sure that teacher should really be teaching, but that comment stuck with me for a long time. It wasn’t until I took one of those personality tests for a job that I realized there were people out there like me! And hey, they’ve found careers and success and happiness despite their introverted-ness! Not only did I stop feeling like a freak, I realized that there was a whole big world of introverts out there. And if they could do all these amazing things, so could I. Reading the report from the quiz drove home that point even further. As I dove deeper into what characteristics made up my personality type, the more I found myself nodding my head with the good and the bad. See, for me, knowledge is power. And once I learned the theories and approaches to personality and work environments, I felt empowered to leverage them in certain situations. Instead of trying to appease people in a role I’m not meant to be in, I channel all my energy into my strengths which in return makes me a better employee, co-worker, and leader. Knowing your strengths and personalities better also helps you when looking for new career options. If you’re like me (an INFJ-T), you will know that any career option that requires copious amounts of face to face meetings or customer service is not a great option. With this knowledge in hand, you’re more likely to sift through and narrow down your options much quicker. One test that I really identified with and has actually helped me improve on my strengths is the CliftonStrengths (formerly known as StrengthsFinder). After reading the “common characteristics” of these themes, I was surprised at how true they were. Even better, the results are given to you with actionable steps to take to leverage your skills. I’m all about those action steps. I didn’t realize how powerful learning my love language would be, but when my husband also took it, we had this shared resource to help guide us through some of our communication. Learning how he preferred love to be shown helped me do a better job of exactly that. But Love Languages aren’t just for significant others/spouses. You can branch off into Love Languages for friends or family. There’s an Apology Language and even an Anger Language available. Do these tests mean we’re all or nothing? Hell no. They’re just another tool in the toolbox to use when it feels good and right to do so. 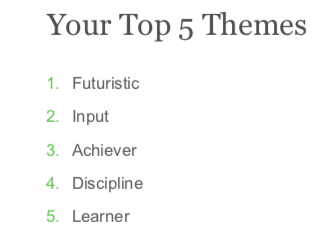 Personally, I have found that taking these quizzes and learning more about myself through my personality and strengths has empowered me to make better decisions about things. I think twice before agreeing to something and run through my mental checklist of whether it fits with who I am and who I want to be. Does it align with my values? With the future I want? So what does all of this mean for a survivor, specifically? Well, I think for survivors, some of the biggest issues we face are the loss of connection, of meaningful interactions with other human beings, and not being able to formulate who we are. Starting from a shared or common language is a great place to start, though. And that’s why I think these quizzes/tests have been instrumental in many survivor’s recoveries. Labels and generalizations don’t have to define you or box you in as most people assume. They can also be great tools to leverage when you feel connected to the community it belongs to.